I sincerely congratulate you all on the fourth Sunday of Great Lent, when we celebrate the memory of our holy, venerable, and God-bearing father, John of the Ladder, who labored greatly to open unto us the mysteries of the spiritual life. The venerable one teaches us that spiritual growth is not the act of a single moment: it is neither possible to gather spiritual strength immediately nor to acquire spiritual wisdom immediately. In order to acquire the gifts of the Spirit, we need to move gradually, from the simple to the complex, as if ascending a ladder reaching from earth to heaven. 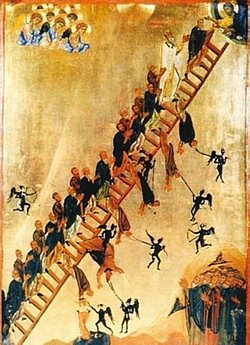 During Great Lent we are all given the opportunity to give thought to this ascent, first of all by assessing our own position on this ladder. Where are we? At the beginning, in the middle, or are we perhaps moving towards perfection and can see how much has been accomplished? Or perhaps we are at the very bottom and have not even stepped onto this ladder? Sometimes it happens that when we begin to think that we are achieving the cherished height, we suddenly find ourselves at the very bottom, and at some point it occurs to us that we have not taken even the first step on this ladder. The ascent to God is impossible without strong faith. Therefore, it is no accident that today, on the day commemorating John of the Ladder, when the Church invites us to consider the paths of spiritual ascent, that we should hear the Gospel reading from Mark, in which it is said that faith is a necessary precondition for the performance of miracles (cf. Mark 9:17-31). The Lord addresses the father of the unfortunate youth who was afflicted by an evil spirit, who often lapsed into unconsciousness, fell to the ground, and writhed in convulsions – who was, in short, incapacitated. The Lord said to the father of the sick youth who asked for healing: If thou canst believe, all things are possible to him that believeth [Mark 9:23] – astonishing words, full of Divine wisdom. What if faith is accompanied by constantly looking backwards? What if we constantly gaze from right to left and, catching sight of the movement of the world around us, become subject to temptations and doubts? What if we consider that faith consists only of the fulfillment of external requirements? If this is the case, then we have no faith at all. And if we have no faith at all, then how can we hope for a miracle from God? But would not the salvation of us sinners be a miracle? Would not the opening of the gates of the Heavenly Kingdom to us – despite our sin, our unrighteousness, our imperfection – be a miracle? For it is only by the power of God that these gates can be opened to us. Do we seriously think that our virtues are capable of opening the gates of Paradise to us? This will never be. You and I will never assemble that many virtues. God opens the gates of eternity to us in response to our faith. But if we live in sincere faith, then our deeds will be accepted, for faith, if it hath not works, is dead (James 2:18). John Chrysostom speaks about this marvelously: “Faith is incapable of saving man.” Even faith! God did not desire to save us without our participation, for which reason he requires faith of us. Even faith will not open the gates of Paradise. Only God can open them, just as when He performed the great miracle of raising from infirmity, through the faith of his parents, the unfortunate deaf man who had collapsed. In reply to the Savior’s words, they had said: Lord, I believe; help Thou mine unbelief [Mark 9:24]. So, in response to our faith, in response to our sincere confession of the weakness of this faith, in response to our modest efforts to live by faith, God will perform a miracle for us, too, by opening to us the gates of His Kingdom. Thus, faith is a necessary precondition for salvation, and not only for salvation, but for eternity as well. Faith gives us enormous vitality. 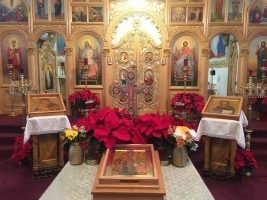 St. Ephraim wonderfully said: “Where there is faith, there is strength; but where there is no faith, there is weakness.” We should stamp these words in gold letters, that each of our contemporaries would repeat them. If we take a closer look at the history of mankind and at the history of our country, one thing becomes obvious: whenever there was faith, there was also victory. He who places himself under the right hand of God finds a particle of Divine power capable of transfiguring his life, capable of strengthening him to such an extent that the world around him is transfigured as well. It is in response to such strength of faith that God grants His grace and opens the gates of His Kingdom to us. The fourth Sunday of Great Lent draws our attention again and again to the necessity for spiritual ascent. 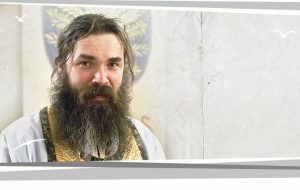 Four weeks of the fast have passed, and everyone can say what has happened to him during this time. Have there been any changes for the better? Have we been able to free ourselves from vices, evil thoughts, and weakness, finding the inner resolve to ascend from strength to strength? Or have these days passed in vanity, in ordinary, earthly, everyday concerns, without any special attention to the spiritual life? May the Lord help us, who find ourselves in the heart of Great Lent, to find the strength to move forward, going from strength to strength on the path to the Kingdom of God. Amen. Delivered on April 3, 2011, in the Cathedral of Christ the Savior in Moscow.